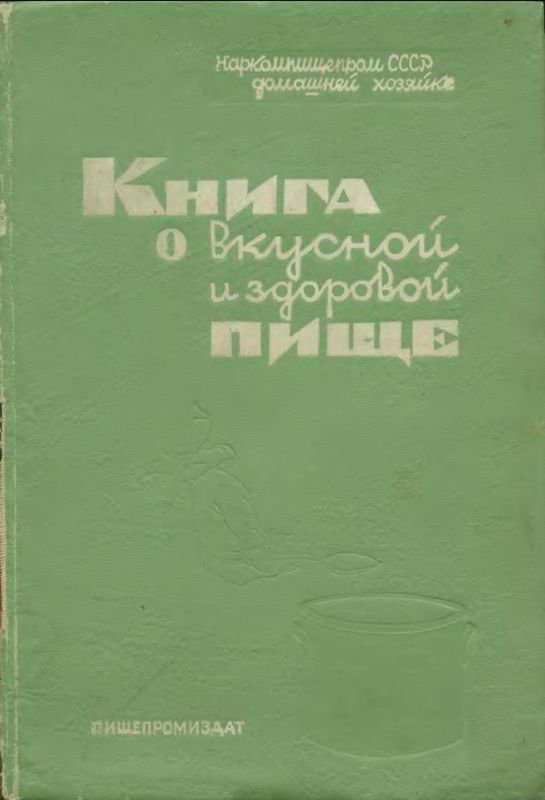 “Book of Tasty and Healthy Food” is a soviet collection of culinary recipes and food-preparation hints, curated by the USSR Ministry of Food and by people’s commissar Anastas Mikoyan himself. It was first published in 1939. This book discusses the basics of healthy eating, provides information about food products made in USSR (subsequently the Russian Federation) and gives recipes of various dishes. Updated editions of the book were coming out almost every year. There were about 8 million copies of the book printed between 1952 and 1999. Currently the “Book of Tasty and Healthy Food” is viewed as one of canonic symbols of Soviet propaganda: the assortment of ingredients described in the book was almost never available in stores to an average Soviet citizen. The idea to create a modernized and universal culinary book first appeared in mid-1930s, after food ration cards were done away with. It was first envisioned as a scientific work, emphasizing the importance of healthy nutrition. It was written by experienced chefs, doctors and prominent scientists. First edition was published in 1939, becoming the first big cookbook of the USSR. Recipes and additional information were tailored to reflect the economic difficulties the country and it’s citizens were facing at the time. Authors did their best to teach the reader to prepare delicious and most importantly, nutritious dishes from inexpensive ingredients. The book didn’t focus exclusively on traditional Russian cuisine, it also included some English and French dishes, and also many recipes from other republics of the USSR. “Uzbek Cuisine” by Karim Mahmudov. Karim Mahmudov was a scientist, researcher, philosopher, historian, writer and cook. His name is known well beyond Uzbekistan. Mr. Mahmudov devoted many years of his life to Uzbek cuisine research, traveling around Uzbekistan (cities as well as smallest villages), acquiring encyclopedic knowledge of not only recipes, but also chemistry and physics of culinary processes, history, culture, biology and geography. Uzbekistan has a fascinating history. Its cities were main centers of Persian civilization as early as 6th century BC. The Silk Road passed right through it – making a significant contribution to trade, scholarship, culture, religion and laying the foundation in the development of the great civilizations of China, India, Ancient Egypt, Persia, Arabia, and Ancient Rome. Marco Polo marveled at it. Alexander the Great and Genghis Khan, Czars of Russia and the Soviets led military campaigns to conquer and control it. Fearsome Timur (Tamerlane) has made one of its cities, Samarkand, his beautiful capital. Remaining archeological monuments tell stories from those days. One can also turn back the clock by enjoying some of the delicious Uzbek dishes. When discussing Georgian food, it is worth mentioning the fundamental differences between Western and Eastern Georgian cuisine. These differences are caused not only by nature and climate, but also by Turkish influence on Western Georgia and Iranian influence on Eastern Georgia. As the result, several key ingredients are used differently until this day. In Western Georgia, bread and corn flour flat bread (mchadi) are very popular, while in Eastern Georgia wheat bread is preferred. As far as meat, in Eastern Georgia lamb is very popular (in addition to beef) and animal fats comprise a large part of the diet. In Western Georgia, meat is mostly replaced by poultry – chicken and turkey. Western Georgia is characterized by dishes that are spicier, sauces are somewhat different. Long existence of the Georgian nation at the crossroads of different cultures led to none of the meat sources being dominant – Georgian meat dishes can be made with pork, lamb, beef or poultry. Such tolerance is not typical of the other Eastern nations. Overall, beef and poultry are more popular choices. Different types of nuts are widely used in Georgian cuisine – hazelnuts, almonds, etc. – although walnuts are used most often. They are a required ingredient for many dressings and sauces equally suitable for poultry, vegetable and even fish dishes. Nuts are added to meat soups, pastry, cold salads and hot entrées. It is impossible to fathom Georgian food without nuts. Herbs are very important in Georgian cuisine also. They are used throughout the year and some examples are tarragon, basil, cilantro, savory, leeks, scallions, mint. Frequent and generous use of cheese also sets Georgian cuisine apart. Cheese is not only an appetizer, but also an ingredient in a wide variety of soups and entrées. As typical for all cuisines of the Caucasus region, skewer is widely used not only for meat dishes, but also for vegetable, fish and cheese dishes. Special techniques are employed for preparing various dishes, such as creation of sour, sour-fat and sour-egg environments for soups and sauces. Similar to French cuisine, Georgia is famous for sauces. Georgian sauces have different ingredients and methods of preparation, however. Most often it is sour berry and fruit juices or purees with blackthorn, pomegranate, blackberry, barberry and tomatoes. Nut-based sauces are also very popular. Chicken may be served with several different sauces – sacebeli, sacivi, garo, tkemali, garlic-wine, nut, barberry, etc. Variety of Georgian cuisine is largely accomplished by switching between different sauces for entrées. Sauces are consumed with lentils, eggplants and poultry, etc, but sometimes Georgian sauces act as separate dishes and are eaten with bread. Third edition of the book “Armenian Cookery” published in 1983 introduces readers with Armenian national cuisine. It contains recipes and techniques for cooking more than 500 various dishes. Some dishes of the old Armenian cuisine are especially interesting, and thanks to their taste and high nutritional value and a still recommended for inclusion in regular menu. Current edition of the book expanded with 130 additional recipes. Out of that number — approximately 70 are recipes of vintage dishes and desserts, and more than 60 recipes of Eastern dishes which have been included into regular Armenian menu and are widely cooked. This book is designed for chefs or home cooks. From the ancient times Ukrainian cuisine was famous for its variety of dishes and great taste. This variety and taste achieved not only by the multitude of the ingredients used, but also by various combination of ingredients and cooking methods used. For example Ukrainian and Kiev-style borscht use 20 ingredients, Selyansky (village-style), Poltavsky, and Green Ukrainian use 18 ingredients, Chernigovsky — 16, Borscht with Carp — 17, and so on. In addition to that cooking borscht uses not only cooking in water, but also frying and braising. Some meat or fish dishes also require various cooking techniques which gives them unique flavor and aroma. Many dishes of the Ukrainian cuisine are dishes with stuffing. Especially tasty and healthy are dishes where meat and vegetables are combined — Cabbage Rolls with Meat, Volinsky Krucheniki, and Beef Stuffed with Beets. Ukrainian cuisine is rich with dishes and pastries made with wheat flour. Some of the the most famous dishes are Vareniki (known in US as Peirogi), Halushki, Pancakes, and Grechaniki. Large number of dishes are cooked using milk and farmers cheese — soups, casseroles, puddings, sirniki, blini with cheese, and others. Many Ukrainian dishes has name and content similar to dishes of Western Slavic people. This book presents approximately 1000 recipes of various dishes cooked using modern cooking techniques. Each recipe lists ingredients of for a 4-5 member family. “Modern Ukrainian Cuisine” was originally published in 1974 in Ukrainian language. The book was translated into Russian and published in 1977.